It is time for yet another interesting collection of talks at the Santa Monica Art Studios which will be given by Chuck Steidel (MacArthur fellow at Caltech, working in Astronomy), Reza Aslan (writer and religious scholar), and Douglad Gerry (composer, guitarist, and audio engineer). The series has been organized by K.C. Cole, who has this great ability to bring together experts from all sorts of different fields, pick a topic and then ponder over a ground that is common to all these subject matters. I absolutley enjoy going to these talks and talking with people afterwards. For those of you who live on the west side of town and have been watching too much T.V. on the weekends, I highly encourage coming over to the Hangar and whetting your intellectual side. You can find out more about the talks here. The talk is going to start at 6:30 pm on Dec. 16th. The First International Conference on Quantum Error-Correction is almost here. I will be blogging about the talks that I am planning on attending. I am quite excited for I get to hear Peter Shor give a keynote talk on Friday (21st Dec.) morning. The conference will be held in the Davidson Conference Center at the University of Southern California from Dec. 17 till the 21st. The program can be found here. Mohammad Amin from D-Wave will be talking on Monday (17th). I am sure his talk is going to end up with a barrage of questions. Looking forward to it all. 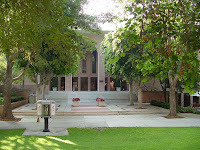 "WOW, that was an eye-opener", was what I overheard someone say as people came out of Beckman auditorium at Caltech on December 6. I had the honor and pleasure of hearing Asra Nomani talk about her life. She is an accomplished journalist and social activist. I don't want to list her accomplishments here, for that is something that the readers can read on her website which lists her short biography. I would rather describe the experience of hearing her speak. I had known about her talk for some time now, and had marked my social calendar way back in August. When December 6 finally arrived, I was all set to drive to Caltech. It was a rather cold night and I was by myself for one of my dear friends bailed out on me, stating that he would rather stay at home than brave the traffic on the interstate 10 to go to Caltech and hear Asra's talk. I guess we all have our priorities in life. I arrived at Beckman in time and was surprised to find far more people than I had expected on a damp and cold, Thursday evening. The median age was fifty, but I felt comfortable enough in my surroundings. From the program I figured that she would be speaking about her recent book, entitled, "Standing Alone: An American Woman's Struggle for the Soul of Islam". She came on stage amidst thunderous applause from the audience, and looked graceful, confident and composed. I was expecting a laptop hooked up to some projector which would start a powerpoint presentation, but to my surprise all I found was a small mike attached to the collar of her pink woollen winter-coat. Her voice was soft, and she walked around the stage relating the story of her life from the time she was born in Mumbai to the time she came to Morgantown, Virginia with her family. She described the struggle within herself to reconcile her interpretation of Islam and its teachings to what she saw was actually being practised by the clergy in the real world. Her description of the ostracism she faced along with other Muslim women in American mosques was touching. She had this ability to connect to a mostly Caucasian, Christian-Jewish audience by relating her experience as a Muslim woman to the kind of struggles that women in the Christian-Judeo faith have had to face. She also talked about her time in Karachi, Paskistan, amidst the aftermath of her dear friend (Daniel Pearl's) killing. The talk or rather the story of her life lasted for an hour and a half, after which there was a Q&A session where a young American-born Pakistani woman, who was in her second year of college described the same kind of segregation that Asra had to face in the Morgantown mosque. The student was overwhelmed and in tears. There were many other people who lined up to ask her questions. I stayed to listen to a few more questions which were all very poignant and interesting. I came out of Beckman and the first thought that came to my mind was that seeing Asra speak was worth the hour and a half I spent fighting Los Angeles traffic. It was truly an honor, and I couldn't agree more with the person whom I overheard say, "WOW, that was an eye-opener."